The night sky as seen at 5:22AM EST on December 25th, 2010. Looking South-Southeast from New York, Orion, Cancer and Venus are visible. The Yuletide evening sky should provide a dazzling sight foranyone willing to brave the cold this season. The eastern sky is filled with brilliant stars, creating asort of celestialChristmas tree. This December2010 sky map depicts a view of some of the constellations visible on Christmas in the Northern Hemisphere. Distinctive groupings of stars forming parts of recognizedconstellations, or lying within their boundaries, are known as asterisms.Ranging in size from sprawling naked eye figures to minute stellar arrangements,they are found in every quarter of the sky and at all seasons of the year.? Originally known simply as "the Bird" in ancienttimes, without any indication of what sort of bird it was supposed torepresent, one star grouping later became the constellation Cygnus, the Swan.? But the brightest six stars of Cygnus compose an asterismmore popularly called the Northern Cross.? Bright Deneb decorates the top ofthe cross. Albereo, at the foot of the cross, is really a pair of stars ofbeautifully contrasting colors: A third magnitude orange star and its fifthmagnitude blue companion are clearly visible in even a low-power telescope.? While usually regarded as a summertime pattern, the NorthernCross is best oriented for viewing now, appearing to stand majestically uprighton the northwest horizon at around 8:30 p.m. local time in the NorthernHemisphere, forming an appropriate Christmas symbol. Furthermore, just beforedawn on Easter morning, the cross lies on its side in the eastern sky. Look over toward the southeast part of the sky at around thesame time. Can you see a large package in the sky, tied with a pretty bowacross the middle?? Four bright stars outline the package, while three closetogether and in a straight line form the decorative bow.? This is a picture easily put together by our modernimagination, but tradition tells us that those seven stars form a mighty huntercalled Orion, the most brilliant of all constellations and visible from everyinhabited part of the Earth. Two stars mark his shoulders, two more his kneesand three his belt. As is also the case with the mighty Hercules, the figure ofOrion has been associated in virtually all ancient cultures with great nationalheroes, warriors, or demigods. Yet, in contrast to Hercules, who was creditedwith a detailed series of exploits, Orion is more of a vague and shadowyfigure.? The ancient mythological stories of Orion are so many and soconfused that it is almost impossible to choose between them. Even the originof the name Orion is obscure, though some scholars have suggested a connectionwith the Greek "Arion," meaning warrior.? All, however, agree that Orion was the mightiest hunter inthe world, and he is always pictured in the stars with his club upraised in hisright hand. Hanging from his upraised left hand is the skin of a great lion hehas killed, which he is brandishing in the face of Taurus, the Bull, who ischarging down upon him.?? The legendary French astronomer Nicolas Camille Flammarion(1842-1925) referred to the three belt stars of Orion as "The Three Kings. "And if we assume these three stars represent the Magi, then not too far away,to the east, within the faint zodiacal constellation of Cancer, is the starcluster known as Praesepe, the Manger.? A manger is defined as a trough or open box in which feedfor horses or cattle is placed. But the biblical Book of St. Luke also tells usthat the baby Jesus, wrapped in swaddling clothes, was set down in a mangerbecause there was no room at the inn. In our current Christmas week eveningsky, Praesepe could represent the manger where Christ was placed.? The constellationof Cancer is practically an empty space in the sky, positioned between the twinstars Pollux and Castor of Gemini and the Sickle of Leo. Cancer is completelydevoid of any bright stars and would probably not be considered a constellationat all were it not for the fact that there had to be a sign of the zodiacbetween Gemini and Leo. In the middle of Cancer are two stars called the Aselli ("Donkeys")that are feeding from the Manger; Asellus Borealis and Asellus Australisbracket Praesepe to the north and south, respectively. To the unaided eye, the Mangerappears as a soft, fuzzy patch or dim glow. But using good binoculars and low-power telescopes, theManger is a beautiful object to behold, appearing to contain a splattering ofseveral dozen stars. Using his crude telescope, Galileo wrote in 1610 of seeingPraesepe not as one fuzzy star, but as "a mass of more than 40 smallstars." "She shines in the east in the morning, with a splendidbrightness which eclipses that of all the stars. She is, without comparison,the most magnificent star of our sky; the star of sweet confidences." Indeed, Venus is always bright, but this December itsbrilliance and altitude are exceptional. This month, from mid-northernlatitudes, the lamp-like "Morning Star" rises nearly four hoursbefore sunrise. It may remind those who arise early on Christmas morning of thebiblical "Star in the East." Your clenched fist held at arm's length measures roughly 10 degreesof the sky. At sunrise Venus will reach a maximum altitude about 32 degrees(more than three fists up from the east-southeast horizon) by Christmas. On clear mornings you should have little trouble followingVenus with the naked-eye until sunrise. And on New Year's Eve morning (Dec. 31),a slender crescent moon forms an eye-catching tableau with Venus in the morningsky. Venus will hover well above and to the left of the moon. For those who receive a telescope for a holiday gift, Venuswill present a dazzling and wide crescent image. But there are also two othersplendid planetary targets to gaze at. That very bright "star" that you notice at day'send in December, glowing high in the south, is Jupiter. The planet offers asuperb telescopic showpiece with cloud bands crossing its disk, as well as itsretinue of four large moons. By the end of December, it's setting just before11 p.m. local time. And lastly, in the predawn morning sky with Venus, isSaturn. 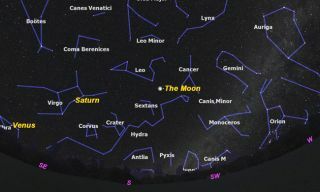 On the morning of Dec. 28, the moon will be passing well to the rightof both Saturn and the bright star Spica. A telescope magnifying 30-power ormore will reveal Saturn's famous rings, now tilted 10-degrees to our line of sight.